Committee has worked since 2013 to get project off the ground; cooperation key to it happening. A large group of residents and dignitaries braved the heat to attend a groundbreaking ceremony at Crooked River Ranch on Tuesday, Aug. 7, to celebrate the start of construction on the Quail Road exit, which will provide a second route on and off the Ranch. Crooked River Ranch is the largest homeowners association in the state of Oregon with 2,646 properties on approximately 10,000 acres. Currently there is a single access road that serves the entire community. The potential for a wildfire threat has been a major concern of residents for some time, with the public land abutting the residential area of Crooked River Ranch classified as extreme by the Jefferson County Forestland Interface Fire Protection Act Study. While a second exit has been attempted in the past, the current Alternate Exit Committee, formed in 2013, has worked with the Bureau of Land Management, Jefferson County, Deschutes County, the CRR Special Road District and the Crooked River Ranch Board of Directors to finally make it a reality. 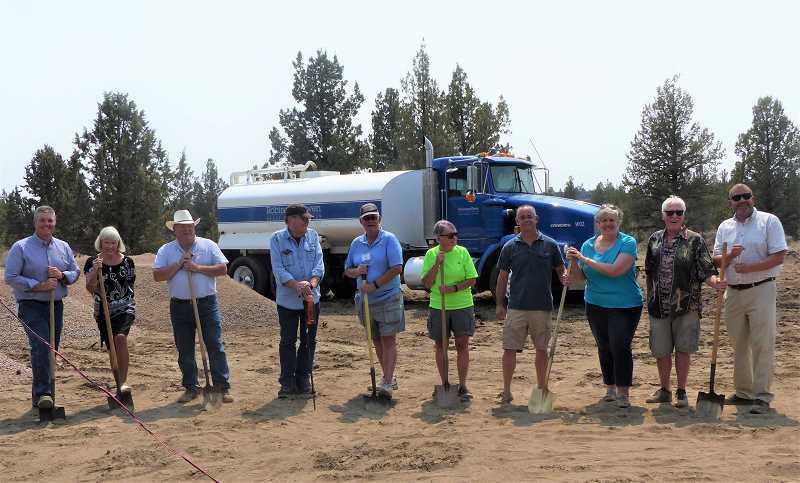 "This project took an enormous amount of cooperation and help from all entities involved," said Judy Lapora, Ranch manager for the Crooked River Ranch Club and Maintenance Association. "Both Jefferson and Deschutes counties each contributed $100,000, in addition to the assistance provided in planning, financing and facilitating the project." Crooked River Ranch allocated $200,000 toward the road construction in order to reduce the loan required to complete the construction, she added. "The balance of approximately $367,000 (including a 20 percent contingency) was secured by Jefferson County on behalf of Crooked River Ranch from the Oregon Transportation Infrastructure Bank and will be repaid through the CRR operating budget." "This very critical project will benefit the entire Ranch by providing two exits in case of an emergency for both evacuation of residents and a second access for first responders and mutual aid," said Lapora. "Many years of hard work will be realized when construction is finished, anticipated to be sometime in October."